The use of numbers in Japanese Haiku. The use of numbers as counters in a haiku makes the situation look very real. It is therefore skilfully used to get this special effect. numbers　in combination with ONE, which are also dear to haiku poets. Here is an interesting LINK in Japanese, where most of them are all listed. I will try and translate them and other haiku with numbers as they come up in the WKD. All translations by Gabi Greve, unless stated otherwise.
. Numbers used by Matsuo Basho 松尾芭蕉 .
. 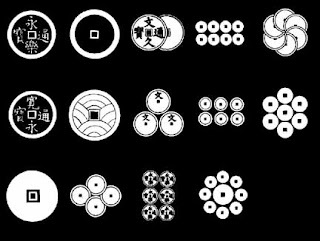 Numbers used by Yosa Buson　与謝蕪村　. .. ONE .. TWO .. THREE .. Some English language haiku poets promote the "rule" not to use ONLY, JUST or some such word to emphasize the fact of ONLY one/two/three things in the scene. I see no reason for this coming from the traditional Japanese haiku. The meaning is different, so the poet has to choose what kind of emotion he wants to convey with his poem.
. kiri hitoha 桐一葉 one paulownia leaf . The last line in Japanese has 6 beats in this transscription.
. Home town, home village - furusato, kokyoo . Tr. Gabi Greve / Read more about this ZEN story here ! She wrote this shortly after the death of her husband. She locked the door and went on to travel. two more days . . . In the steep mountains of Japan, many waterfalls fall in more than one step. Shinji Ogawa explains that Issa is joking on the three "New Year's" celebrations: the first day of First Month, the 15th day (called "Little New Year's") and the 20th day (called "20th Day New Year's"). He implies that celebrating the new year so many times is a bit much. peonies scatter . . .
. Yosa Buson　与謝蕪村 . As you copy one Chinese character, you make three bows in prayer. 床机 little benches, mostly made of bamboo, for two people to sit on. They are light and people could carry them to enjoy a cool evening in summer. The number FOUR (yon) is not very popular in Japan, because one of it's readings is SHI, which can also mean DEATH. You never give a present with FOUR pieces of something. Hotels and hospitals do not have a room with number 4.
refers to the way they are stapled on a tray. kiri-goza ya zeni ga shi go mon ume no hana.
. gosun kugi 五寸釘 nail of 5 sun, for cursing people . one sun 寸 is about 3 cm or 1 inch. In this haiku, Issa is playing with perspective. From where he and the reed thrush are located, the distant mountain appears to be only 4 or 5 sun tall. A sun is equal to 1.2 inches. an expression for the money you have to pay at the ferry over the river Sansu to the other world. Many Japanese kept roku mon under their pillow, just in case they die and needed it over night. Here they are arranged as Japanese family crests. Roku Mon was the family crest of the famous samurai clan of the SANADA. Sanada Masayuki is expecially famous, because he fought bravely against Tokugawa Ieyasu. The English is an explanatory rendering to make the meaning more clear. Issa later revises this haiku so that only "four or five" radishes are left. Shinji Ogawa explains, "The radishes are not stored in a storage house but are buried in the ground in the late autumn for the winter. In the snow-country, usually a stick is standing to locate the spot covered with snow."
. Roku Jizō 六地蔵 Roku Jizo, Six Jizo Statues . one RI is about 4 km. Here Shiki is taling about the castle of Matsuyama and the surrounding fertile plains. Maybe he is visiting one of the famous peony temples of Japan. He liked camellias very much and had a lot of trees planted in his garden in Kamakura. issha senri 一瀉千里 (いっしゃせんり) "at top speed"
In the Toyama region, on this day people made a pilgrimage to a Buddhist temple. There are ninety-eight thousand families in Kyoto. in the cold　. . .
Sensei explained that the use of hyakuman, meaning a large number, was very skillful here. It is not simple shasei, but tells the reader about the impression of the poet. When translating, we have to be careful about the names of a month, since they were used in the way of the Asian Lunar Calendar. On January 1, 1873, Japan adopted the Gregorian calendar. This is the date of the Death-Day anniversary of the great poet, Bashoo. Written at the outbreak of World War II in 1941 （昭和１６年). "During the war, Japanese sources used the name Greater East Asia War (大東亜戦争, Dai Tō-A Sensō). This name was chosen by a cabinet decision on December 10, 1941, to refer to both the war with the western Allies and the ongoing war in China. The name was released to the public two days later, on December 12, with an explanation that it involved Asian nations achieving independence from the Western powers through the Greater East Asia Co-prosperity Sphere." "Thousands of enemies may come"
This is the night of the full moon, and every poet has been waiting for this most famous night ! ikusobaku いくそばく/ 幾そ許 / 幾─ how many? how much? ***** . August 1 (hassaku 八朔) . ***** Numbers used in Kigo !!!!! If you've ever wanted to know what the Three Learnings of the Mahyana, the Fivefold Cause & Effect, or the Thirty-two Marks of Perfection of the Buddha are, this is the page for you. 一乘之珠 The pearl of the One yāna, i.e. The Lotus Scripture. 一九 A Shingon term for Amitābha. 一代 A human lifetime; especially the lifetime of Śākyamuni on earth. Adds greatly to the night cold. Thank you, gabi san, for sharing this informations. A poor translation can ruin a poem. the colloquial anguage of that day. Gabi you are a precious resource. Arigato. The humor of this haiku lies in two facts: (1) the Third Month is the last month of spring in the old lunar calendar, and (2) "returning geese" is a spring season word. The geese have started north at the last possible moment: the day before summer. This hokku was written sometime between 1789 and 1809. The hiro unit was used when measuring length (especially of cloth, rope, and fishing line) or depth (of the ocean), and one hiro was of varying lengths in different contexts but was most commonly 5.97 feet, so the raindrops are literally falling about 600 feet, but the number 100 was frequently used to mean a vague large number, a meaning Issa seems to be using here. one RI 里 is about 3.93 kilometers. the 30th of Ninth Month! This hokku is from the summer of 1792, when Issa, age 30, had left Edo and was traveling around in western Japan. That summer he visited Kyoto and nearby Osaka, and in early autumn he went to Awaji Island and then to Shikoku. In Issa's hokku collection for 1792, this hokku is placed exactly between a series of hokku about Kyoto and another series about Osaka and the area around it, so it seems safe to conclude that it is about his trip from Kyoto to Osaka. Since Issa wasn't a wealthy man and this hokku is about coolness, he probably took the cool overnight boat that left from Fushimi, just south of Kyoto, and went down the Yodo River, arriving in the morning at the Osaka waterfront. It seems Issa was able to sleep on the boat, so when he went to sleep he was just south of Kyoto, and when he woke he was in Osaka. The phrase 'in/during a single dream' in the second line means 1) during the time one is dreaming or 2) in a very short-seeming time. In this hokku Issa seems to use both meanings, since he sleeps and dreams on the boat and then is amazed and dazed, as if he were still dreaming, by the many differences between the elegant old capital and the bustling, dynamic harbor city of Osaka, the economic center of western Japan. Without walking and getting hot or even feeling much time passing, he has suddenly traversed a short geographical distance along with much larger cultural, linguistic, and economic distances and feels as if he were between worlds. Literally, the falling leaves make for a "busy" scene (sewashina). 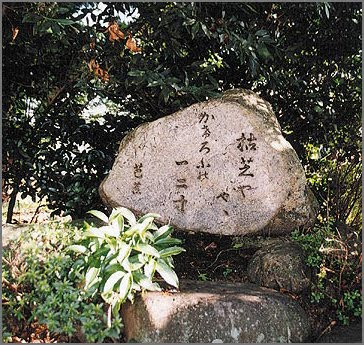 Shinji Ogawa notes, "The phrase kiri hito ha (one leaf of paulownia) is a well-established poetic expression that originated from Enanji, a Chinese classic of the third century. Rebellious Issa applies his realistic observation by counting the leaves, two, three, four ... destroying the original meaning of the phrase. As a result, the haiku is very comical." Ikana is an old word that has the modern equivalent, dono yôna or donna ("what sort of"); Kogo dai jiten (Shogakukan 1983) 100. Issa wrote this haiku in Second Month, 1824. The timing is significant; as Shinji Ogawa points out, the poet was left alone in the world by the deaths of his wife and son the year before, and he had not yet married his second wife (this would happen later in 1824, in Fifth Month). Shinji paraphrases: "Whatever the day is (busy, or uneventful, or happy, or sad; one thing is certain:) the nightingale's alone and I'm alone." This haiku has the prescript, "At Ueno." Ueno is a famous place for blossom viewing. On the ninth and tenth days of the month, the blossoms have hit their peak.